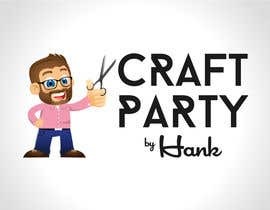 Need a logo for a guy who does craft parties at peoples' homes -- teaching groups to make stationery, cards, and more. See file "examplemascot" for the style desired: **Get as close to this style as possible. ** The mascot should be holding a pair of scissors up in the air, with one arm, "triumphantly." 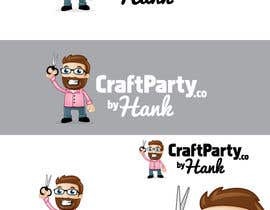 The mascot should be based on the attached "Hank" images, and should be wearing jeans with a solid color button-down shirt. Please add black glasses (see attached "glasses" image). * "[login to view URL]" should be large and block lettering in the same height, or nearly the same height, as the mascot (use your best judgement as a designer to decide what looks best in terms of line height). 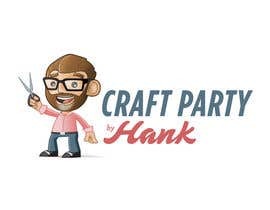 You may want to stylize this domain name text so it appears "crafted", i.e.- stamped-on, or embossed, or something like that, but it should look professional and clean. * the word "by" should be smaller, bolded block lettering that's plain. 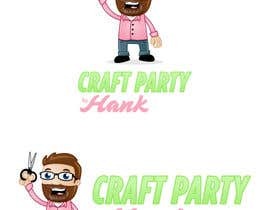 * the word "Hank" should be in a "masculine cursive" font. Please do not submit any further designs. We updated the design on #20. Thanks.